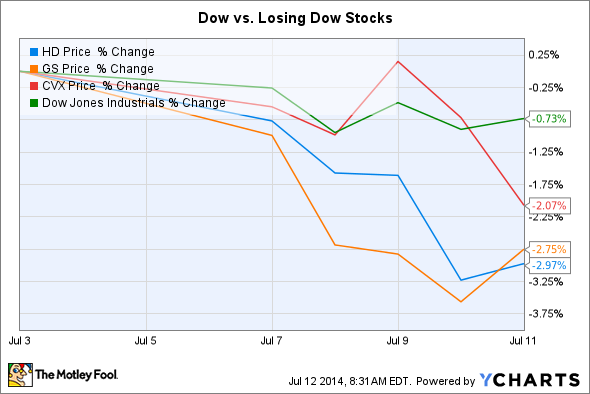 The Dow Jones Industrials fell from their recent highs, and these stocks were a big part why. The Dow Jones Industrials (DJINDICES:^DJI) weren't able to build on their momentum from before the July 4th holiday, falling 125 points as news both expected and unexpected forced investors to reassess their overall views on the stock market's likely future direction. From steady-as-we-go comments from the Federal Reserve to financial-system stresses in Portugal, investors had to consider a wide range of different factors in their short-term investing views. Among the biggest victims of the week were Home Depot (NYSE:HD), Goldman Sachs (NYSE:GS), and Chevron (NYSE:CVX), which all fell more steeply than the Dow. Home Depot fell almost 3% in sympathy with poor performance from a niche player in the home-improvement sector. Poor results from hardwood-flooring specialist Lumber Liquidators led many investors to conclude that the prospects for the whole industry aren't as favorable as they've been in recent years, with Lumber Liquidators saying that traffic was well below expectations and that same-store sales would plunge more than 7% from year-ago levels. Home Depot's own comparables were sluggish last quarter, but the home-improvement leader still expects solid sales gains for the full year. Moreover, Home Depot has done a good job of thwarting negative views even when the housing market wasn't as healthy as it has been lately, so this week's declines might be overblown if the company can give a strong report later this earnings season. Goldman Sachs gave up 2.75% in the aftermath of an analyst firm cutting its earnings estimates for the investment bank. Investors might believe that a steady bull market would be the best of all worlds for an investment bank, but Goldman has suffered from relatively low levels of volatility and a resulting lack of trading activity in many of its key markets. In particular, the Fed's course on interest rates is likely to lead to higher yields and lower bond prices in time, and that could put pressure on Goldman's fixed-income business. Moreover, the constant threat of regulation has led many investors to wonder if Goldman can ever fully recover to its pre-financial crisis pace of growth. Chevron declined more than 2%, with most of the loss coming as a result of its preliminary results for the second quarter. Most headlines touted how Chevron would post better net income figures than the previous quarter, but most of the profit jump comes from one-time gains on strategic sales of assets. Production levels were down overall, and a roughly 10% decline in natural-gas prices in the U.S. didn't help on the revenue front. With geopolitical risk weighing on the entire energy industry, Chevron will need to address its production challenges more head-on in order to give investors the long-term confidence they need.